The Duchess of Sussex's father has said his daughter cried when he confessed he would not be attending her wedding to Prince Harry. In a world exclusive interview with ITV’s Good Morning Britain, Thomas Markle said he had broken the news to Meghan in an emotional phone call just days before she was due to walk down the aisle in Windsor Castle’s St George’s Chapel. Mr Markle said: "They were disappointed. Meghan cried, I’m sure, and they both said ‘Take care of yourself, we are really worried about you’." In his chat with Susanna Reid and Piers Morgan, Mr Markle spoke of his relationship with the royal family, missing his daughter's wedding and what it's like having a Prince as a son-in-law. 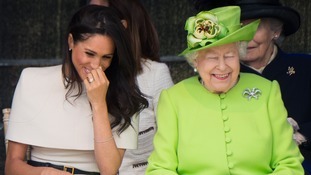 The retired TV lighting director confessed he had cried as he watched the royal ceremony on television, describing his daughter as “beautiful”. “It was incredible watching her,” he said. “I was very proud. I was very upset that it wasn’t me (walking her down the aisle) but the whole world was watching my daughter. I was very happy about that. Prince Charles had the honour of walking Meghan down the aisle after Thomas was forced to drop out following heart surgery. Mr Markle said he was “honoured” that the Prince of Wales took on the job of walking Meghan down the aisle but made clear his disappointment at not taking on the job himself. "I absolutely wanted to walk my daughter down the aisle,” he said, adding: "I can’t think of a better replacement than someone like Prince Charles." Much of the run-up to the royal wedding was shrouded by speculation that Mr Markle, who at the time was set to walk his daughter down the isle, had staged paparazzi shots of him preparing his wedding suit. Commenting on the controversy he said: "They'd take photos of me grabbing a beer, take photos of me getting into my car... they'd take photos of me making me look negative." He continued to say that he "spoke to them both and apologised" for the images. He insisted that Harry and Meghan were "very forgiving" and said that everything was still ready for him to attend the wedding in Windsor. He added: "I couldn't get over the fact that had happened, all that stuff was working on me. I had a heart condition." Seeminlgy unfazed by his daughter marrying into the royal family, Mr Markle said his daughter had "been a princess since the day she was born", adding: "He made a good pick, didn't he?". He also recounted the moment Harry had asked for Meghan's hand in marriage, saying: "Harry asked for her hand on the phone and I said: 'You are a gentleman, promise me you will never raise your hand against my daughter and of course I will grant you my permission'." Speaking of the first time he spoke to his daughter about her new boyfriend, he said: "The first phone calls were 'dad I have a new boyfriend' and I said that's really nice and she said 'He's British' and I said 'That's really nice,' and eventually the third time around was like 'He's a Prince.'" He continued: "And at that point, she said 'it's Harry' and I said 'oh, Harry okay!'" Thomas Markle told Good Morning Britain that his daughter went on to say she had to call Prince Harry 'H' "so that nobody knows" she was dating him before their relationship was made official. Asked about her choice of husband, Mr Markle told Good Morning Britian he thought Harry was "great" and "an interesting guy". 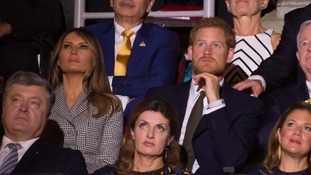 He also revealed the pair had spoken about politics, and said he had held conversations with the Duke of Sussex about Donald Trump and Brexit. He said: "Our conversation was I was complaining about not liking Donald Trump, he said 'give Donald Trump a chance'. "I sort of disagreed with that." When asked about details of the Brexit conversation, he said: "It was just a loose conversation... I think he (the Duke of Sussex) was open to the experiment." Mr Markle said that he expects his daughter will want to try for children soon. He told the programme: "She's wanted children for a long time and when she met Harry and she spoke how much she loves him, there's got to be a child in the making, somewhere soon."